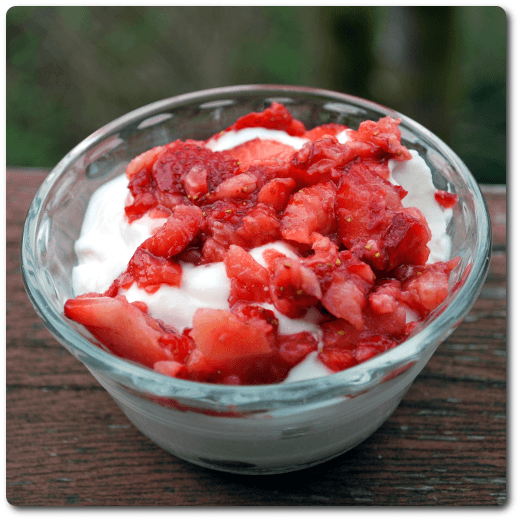 This Greek yogurt parfait has the amazing blend of fresh strawberries and balsamic vinegar. Wash and hull the strawberries. Add to blender. Add balsamic vinegar. Add salt, if desired. Serve one or two heaping spoonfuls of blender mixture per each cup of Greek yogurt. In our experiments, we don't mind that the fruit blends up pretty chunky. You can add water to the ingredients in the blender before chopping to make a purée instead of chopped fruits, but you'll probably have to pour and press off the water before adding to the yogurt, lest you make a slimy mess. If you do that, you'll lose some of the vinegar as well. In that case, add the vinegar after puréeing and draining the berries. Mix well manually. You can store the berry mixture in the fridge for two or three days, but we suspect it'll go fast—especially if you decide to use it as a vanilla bean ice cream topping!